Snow :: Inside & Out! Are you sick of me talking about snow yet? Maybe we should just all sing this song and be done with it. I mean, we get a lot of snow here, but this is pretty early in the season to have ANOTHER foot of it. And lots of dangerous (but beautiful, and according to my boys, tasty) icicles hanging about. The girl volunteered to head out early and shovel. Don't feel bad for her - she volunteered. Also, turns out her next door friend had a snow day, so they were out shoveling our driveway together. Now my girl wants a snow day, too... so I may have let her out of a few subjects today. The boys helped some. Maybe. Did I mention I was grateful for a roof over my head? I am. Very. Do you see my snowflakes? Inspired by Amy's last year. The girl and I cut a bunch of snowflakes out of coffee filters (the best snowflake cutting paper, I think - and we don't even drink coffee). I also made a few teeny ones out of tissue paper when we ran out. They look really different in different lighting. Look! The sun came out! I think I might need some more for the side windows. But I'm really digging this little bit of happy. We do snowflakes in the windows (nearly) every year - but Amy's photo inspired me to step it up a notch. To get a proper, six-sided snowflake from a coffee filter or circle of paper, just fold it in half, then in thirds, then in half again and snip away. If you use square paper, here's a reminder on how to fold it. I taped the first row of flakes to the top of my window - the rest were all added one by one with a bit of gluestick. They are stuck to each other, not the window. I did the fill-in-the-blank method. Writing is HARD for this kiddo. The girl's orthodontist has a point system (I think a lot of them do similar programs) and one of the things you can get points for is a good report card. Hmmm. We don't do report cards... I found this one online and printed it out. It looks nice and besides not having quite enough lines for subjects, it was just right. And the next step at the orthodontist office: front brackets. With pink bands on them. I think this picture is funny because she is holding her doll - and both of their headgear is on the little table. Poor girl, she's been eating a lot of mashed potatoes and mac'n'cheese because her mouth is still sore. The kids had fun watching this 'grow' all day. This is a constant here, but the Monkey's reading has taken off lately. Awesome. We did this a few years ago (almost 4?!) when just the girl was studying Earth science. Fun to do it again with all of them. This time we did it the same except with a cashew for the inner core instead of a whopper. Not round, but it's what we had. Swedish: Practices for this year's Lucia Festival are well underway, with the boys as little tomten, but this year the girl is old enough to be in the procession! Much Swedish singing abounds. BTW, Sankte Lucia is the WORST song to get stuck in your head. It just keeps going. And I don't know all the words to that one. I have yet to blog about the boys' adventures in Taekwondo, but they're having fun and had to test on their first 'form' and some kicks and punches. Funny how the kid with fine-motor issues is the one who is constantly playing playdoh, playfoam, Lego, or itty-bitty playmobil pieces. But fine-motor problems he still has. Anyway, I broke out one of our potholder looms for Thomas - now I need to go get more terry loops! Home Ec: Besides getting the kids situated in their rooms (the girl moved upstairs!!! Oh joy! ), Grandma has been teaching the girl to sew. More on that later. I have a cub scout! Since turning 8, Thomas gets to be involved in our neighborhood 'pack'.... and/or 'den'. This is a whole new world for me! Auditions: Her studio is putting on Swan Lake this year, and she had so much fun doing Coppelia last year that she HAD to audition again. I must admit I checked with her multiple times to see if she was SURE she wanted to. Another thing is all. And in other news: I have a new niece! Welcome to the world, Ingrid! I'm sorry I haven't met you yet, but some people in our house are sniffling a little still. Can't wait, though. It's so peaceful and pretty so early in the morning. We got over a foot! When the sun came out, I actually gasped. Another round of storm clouds coming in on the other side of the valley made this amazing blue! Of course all the kids were outside pretty quick - finding their friends while the dads shoveled so we could all get to church (we were kinda hoping it'd be cancelled - shh!). I usually shovel, but not this year. Not yet anyway. And of course they were all back outside after church. Aaron made a huge pot of pasta sauce and set it out to cool in the snow. Now we need to remember to bring it in. Inside, mittens and boots dry near the vents. Snowpants, hats, scarves, jackets hanging anywhere you can find space. This kinda drives me nuts. Inside after dinner: Cozy, warm and dry. How about you? Any snow today? I guess we're supposed to get a little more tomorrow and then 'Blizzard-like conditions with lake effect snow' on Tuesday. Oh dear. Stay tuned! Last week I had to go to the hospital twice for testing (again with the respiratory stuff). Monday I headed in for a chest CT. I was very calm about it until the morning of. Then I kinda freaked out (quietly). I was completely stressed about it. Very very worried about the procedure (which included dye via IV), the results, everything. It was a gloomy day, cloudy and wet and even the songs on an old mix cd from my sister seemed sad and melancholy. Everything went fine, but I was just STRESSED. I was trying to play it cool, but the radiology tech took one look at me and said 'You are okay. I don't want you to worry about this, it's easy.' So apparently I wasn't succeeding. I was stopped in my tracks. My first thought was 'I know her'. When I realized what I was looking at I backtracked back to the desk and asked about it. It would be unveiled the next day, so when I came back on Thursday I would be able to see it. Thursday I was in much better control and much more optimistic. Feeling a little silly about Monday, actually. I listened to the same cd and it seemed cheery. I had also read some inspired words about hope which I needed. I looked for just a few seconds when I passed by in the lobby, but I needed to check in. This was to be my reward for when I was done. Good thing I was in a better place emotionally, because these tests were much harder than Monday's. Not. fun. But I would think - just a little more and then I can go see the Pieta and take some photos of it. And I couldn't stay very long since I was using a babysitter, but long enough. I've always wanted to see this in person since studying it in college. It may be a replica, but it's a good one and I'm grateful to have seen it. I've always been amazed by all the drapery. I can't imagine carving that out of rock. I didn't get to pick my hospital for these tests. Out of the many in the county I could have been sent to, I was so grateful I was sent to this one. I think I needed this. Thomas got to have a friend party this year, and a Lego theme was chosen way back in June when I was stuck in bed... and planned the whole thing. For invitations I knew I wanted to somehow incorporate photos of his Lego minifigures. Shutterfly sent me an offer for 10 free cards, so that was what I decided to do. I had fun taking some shots of his favorite little toys. Quite frankly, the $5.99 shipping for these was quite a bit more than I have spent on invites before, but they turned out cute and were great quality. And of course there was a birthday shirt. Involving 8 Lego minifig's for a new 8 year old. For decorations we put some Duplo (since they're bigger I thought that visually they'd look better) in mason jars for balloon weights. We also set up the Duplo castle stuff on the school cubbies. The girl made the '8' sign. We also hung our traditional birthday buntings and got out all of our Lego books. Sharpie-drawn faces on the yellow cups livened the table up a lot. We went with cupcakes again (with circle-punched photos for the toppers). I thought the Lego Creator gameboard made a cool centerpiece. My kids all did some Duplo stamping as well, to make wrapping paper! The goodie bags were minifig inspired as well (sharpies are cool). In the 'racing room' we made up a ramp the morning of the party. A folding table from the basement (half-folded) with cardboard duct-taped to the end and painter's tape to make lanes. I dug out the checkered flag bunting from Thomas' 4th bday (can't believe I kept it!) and taped it on the sides and we were good to go. When the guests arrived they were welcomed by the guest of honor and checked in by his big sister. They had to pick up their official builder's passes. After I designed these I printed them as photos and trimmed them up. The lanyards I got as a set of 10 on eBay for a couple of dollars. My kids had different versions of these. Thomas' had 'Official VIP Builder's pass' and a star with 'birthday boy' on it. Monkey had 'Official builder's pass & little brother of the VIP' and the girl had 'Assistant Race Coordinator'. We set up one of our Lego tables and some of our Lego bricks in the living room. The kids grabbed some wheels and got busy building. Some of the racers they made were quite impressive. I plugged my camera into the TV and played a slideshow of Legoland photos while they were building. They would run back to the 'building room' to make improvements and then come back and race some more. We didn't really keep track or anything, just whoever wanted to race raced. They got star stickers on the back of their badges color-coordinated for places (gold -1st, silver - 2nd, blue - tie) but it was way casual. We did try a little tournament at the end, but they weren't super competitive about it. They just wanted to make cool cars. After cake and presents we turned on the Clutch Powers dvd, which most of the boys hadn't seen, so it calmed the hyperness down quite a bit. But they kept building and racing until I kicked them out. The birthday boy made sure everyone got their goodybag, which I forgot to take a photo of the contents of until just now - so it's not quite right. A lego minifigure (I already threw away all the packaging), a tub of playdoh, a mini postcard from Legoland, fruitsnacks, and a little coloring book. I thought those turned out cute. The cover I printed as a photo. Inside are little minifig coloring pages I found online. The party was a success, I think everyone had a great time. Happy Birthday to my awesome 8yo. You are amazing. Oh, and here's an 'after' photo. We'll talk about the girl's costume first... looks like the boys are busy anyway. Years ago I thrifted this thick cotton in a grab bag of vintage fabric. 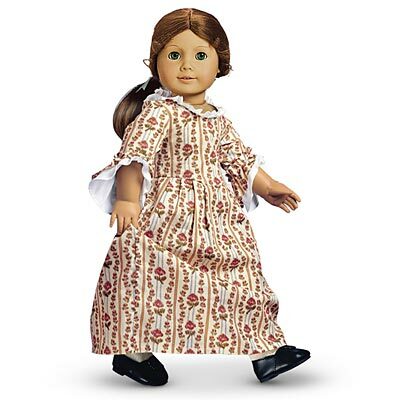 I almost re-donated it, but then realized it looked a lot like the American Girl Doll Felicity's original dress (not the new purple one). There was a couple of yards, so I set it aside in case the girl ever wanted to have a colonial dress. And this year was the year... to hand the fabric over to my mom. Because this is a 'real' dress. Not a 'Lets make it up as we go' Kirsten-type costume. She did an awesome job. The dress (and cap) is so sweet! Mom even added the ruffle at the neck and changed the sleeves to look more like Felicity's. Thanks, Grandma! She was a very pretty colonial girl. Next up: Han Solo. I wasn't too excited about this one because really? Black vest + blue pants = nuff said. But this kid has wanted to be Han Solo forEVER, so let's just do it. And such a seemingly plain outfit needed the detailing to pull this off, I think. Hence the boot covers (inspired by this tutorial) which I have never tried before and had mediocre success with. And man, this kid can work it for the camera. We were going for Han's look in episode IV. Hence the red Correllian blood stripes (red duct tape) and belt + holster (pleather, foil-covered cardboard buckle, hot glue). I drafted my own pattern for the vest to get the right boxy shape. It's double-layered black fleece. I was a little bummed that I didn't have time to thrift him the perfect shirt. He was just going to wear his white dress shirt until right at the last minute I remembered we had a turtleneck in the giveaway bag. I snipped down the front collar (should've gone lower for more accuracy - ha!) and cut off a few inches of each sleeve. Had I thought of this earlier I would have tea-dyed it, but I'm pretty happy with how it looked anyway. And then who do we have here? This kid was SO excited to be Link. He loves playing Zelda video games (and makes up his own Zelda pretend games). I took a lot of inspiration from this site. This was kind of our own combination of the various Links. He wanted to wear the green shirt and leggings (from his Robin costume) kinda like 'Windwaker Link' (but told me the hat is too long for that) and I added sleeves on my made up tunic pattern which I guess I didn't have to. Basically I sewed the tunic + hat (with attached felt elfin ears) and played around to make the other trillions of accessories that Link 'needs'. Pleather boot covers, wrist gauntlets and over the shoulder sword holder. Cardboard, foil duct tape and craft foam shield (which I must admit I think looks awesome). Clear vinyl + red felt and a pleather corked potion. Craft foam boomerang (which isn't the right color, but he really wanted a boomerang. I should have talked him into a slingshot instead). I'm realizing you can't really see the cool collar in the front in these photos. Oh well. And what is that sparkly thing? You never know when you'll start running low on hearts and need to be healed. That is just a bit of scrunched up cellophane wrapping paper with wire attaching it to the sword-holder. Kinda love it. Fight on, Link! Even if very few people knew who you were dressed up like (doesn't matter - still a dream come true for this kid). Off for some Halloween fun! Hope you had a nice Halloween as well. p.s. For actual trick-or-treating it was drizzly and chilly. Felicity managed to hide jeans, rainboots, a turtleneck and a knit hat under her costume (she absolutely REFUSED to consider a coat) to keep warm. Han Solo was fine with his vest (and because he never lasts more than 5 houses). Link squeezed a sweatshirt under his costume and added a pair of gloves. Did they take any accessories? Nope. Not one pleather item. Link strapped hs shield on his back, but both boys opted out of boots, etc. That's okay, I got the pictures, right? You guys, it's nuts here. But we've made big progress on the floor. Now both of the boys' rooms are finished and Aaron's working on our room. So we're crammed into the green room for about a week. And since my desktop computer (with all my photos) is in there, too, and unable to connect to the network temporarily, you get this weak post. Which is kinda killing me because I can't wait to show you the kiddos' Halloween costumes. "like rules, and out of my mind, i really like this book ,because my brother is autistic. oh, and did i mentionthat whoever thinks people with mind and body disorders are weird better give me their address so i can visit them and break their nose."